Minna Floman is a talented Finnish mosaicist. She became involved with the Made in England project as a volunteer, cataloguing, photographing and scanning a great deal of the ware ready for use on the website. Minna’s fiftieth birthday fell whilst she was working on the project. Instead of her friends giving her more conventional gifts, she asked them to donate. 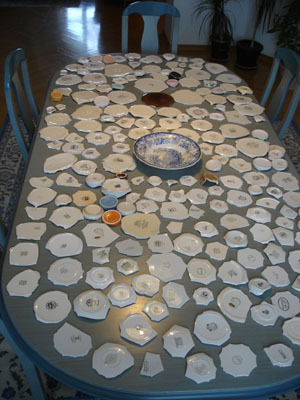 The photograph below shows a sample of the ware she was given, laid out on her dining room table of her apartment in Helsinki. Most of the material given by Minna, her friends and relatives is used in the central roundel second from the right. We have called her extraordinary contribution ‘Found in Finland’. 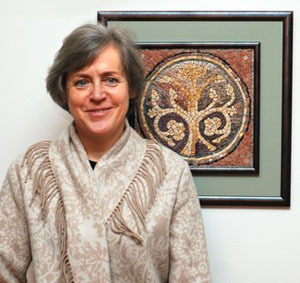 Its quality and range is testament both to her energy and kindness, and to the world importance of the English ceramic industry.